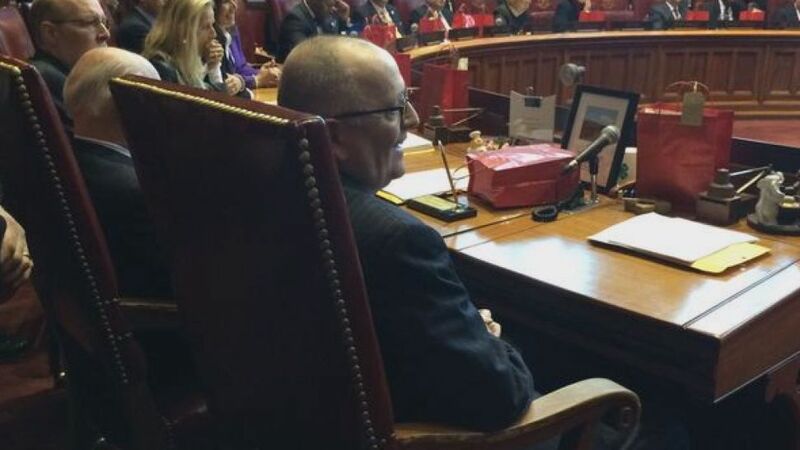 State Sen. Andrew Maynard received a standing ovation when he returned to the senate chambers in Hartford for the first time since suffering a serious injury over the summer. "It was a very moving moment when Sen. Maynard joined us in the chamber today," said Majority Leader Martin Looney. "We had spoken with him a few days ago and he believed that he had recovered sufficiently to be here and to take the oath, so we're pleased that he was. It was probably the highlight of the morning." Looney said Maynard is still recovering after being treated at Rhode Island Hospital, where he remained inpatient for weeks. He was later transferred to the Hospital of Special Care in New Britain for physical and occupational therapy. Although the state senator opted not to campaign or make public appearances ahead of Election day, Maynard was re-elected in November against a Republican challenger. He was sworn in for a new two-year term on Wednesday. “Andy insisted that he return to the senate circle and join his colleagues in taking the oath of office,” said Maynard's sister, Denise Mahoney, in a statement. She said her brother's recovery has “been nothing short of remarkable” and thanked Maynard’s friends and well-wishers, along with the doctors, nurses and therapists who have helped along the way. Maynard continues to undergo physical and occupational therapy to work on his balance, strengthen his right arm and improve the use of his right hand, according to a statement from his office. "He does have some speech aphasia, where he does have some trouble finding the right word for the thought that he has," Looney explained, adding that he has full confidence in the senator's ability to serve. "He was here, he took the oath," Looney said. "He will probably not be present full time for a while, while he continues therapy, but I think his presence here shows his competence."